reading avidly dot com: US readers: anyone want an ARC of Dan Simmons' The Abominable? It's free and I pay postage! 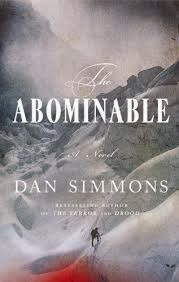 US readers: anyone want an ARC of Dan Simmons' The Abominable? It's free and I pay postage! I have an ARC of The Abominable by Dan Simmons available to anyone in the US who wants it. If you do, all you have to do is be the first one to make a comment on this post, then send an email with an address. I'll even pay postage! Yes I will take it. Thanks! very cool! Now if you would, please, email me your address: oakesn@gmail.com. thanks for giving my book a home! I just sent the email, I hope you get it. definitely! I appreciate it - going out Friday.